The red carpet is an essential product for military ceremonies. So much, that the term 'Military Red Carpet Ceremony' includes it! In military ceremonies there is usually a receiving line, and a red carpet not only serves to guide the guests and attendees in the correct direction of the receiving line, but with military members in their blue or white uniforms (depending on the occasion), the red carpet adds the right color, as well as distinguishes the event with a pathway that throughout history has been associated with extreme reverence for those who walk upon it. CeremonialSupplies.com has the best quality aisle carpet runners available, at prices that won't make a dent! For military reviews that honor a high-ranking dignitary, the red carpet is laid out. This tradition goes back to ancient times when military leaders showed their strength in terms of troops and their obedience, with a military review. It is in this tradition that the red carpet was formalized as a part of a military review ceremony. It was only natural that after the red carpet became a fixed product in military ceremonies, that stanchions and rope would follow. Especially if the goal is to convey dignity and stateliness as associated with the armed forces. 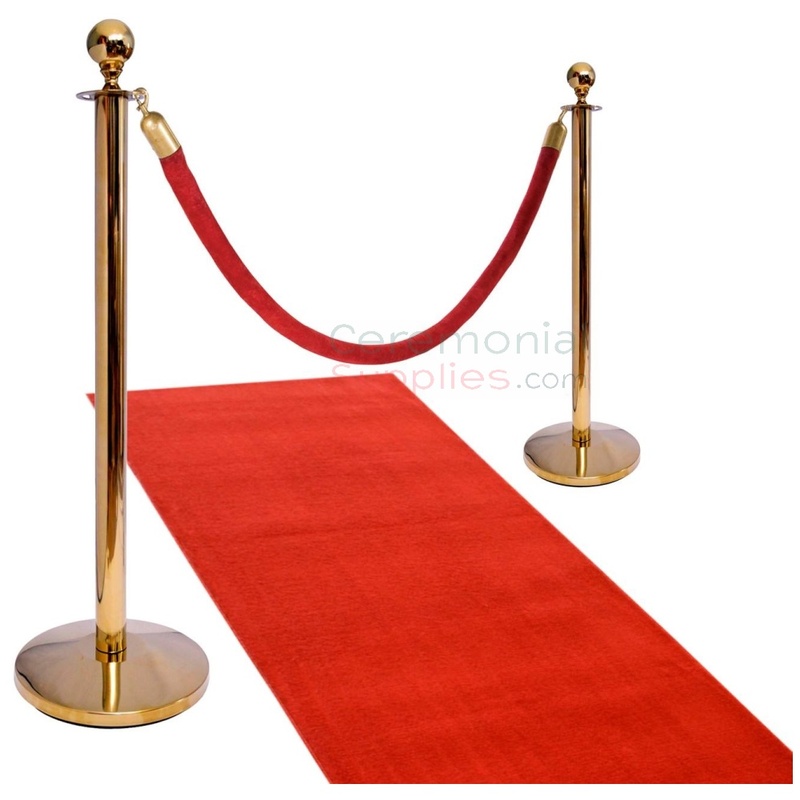 Using stanchions and rope in a military red carpet ceremony maintains an orderly flow of guests and attendees at a receiving line, but they also can be used to cordon off areas of activity. For example, it is customary to take official photographs during a military ceremony, and creating an area specifically dedicated for this, including a step and repeat backdrop banner calls for the use of stanchions and rope to call attention to the area, and to provide a way for guests to watch dignitaries, or other military officers, and guests of the event, watch these personalities pose for their official ceremony photograph. Stanchions and rope are also used in front of the band area, if there will be one, and at the entrance to the venue to create the atmosphere of exclusivity and importance while guests arrive. Military ceremonies used to have a standard, almost austere look, but not anymore! The use of patriotic ribbons for table decorations at a military red carpet ceremony, is one of the many ways to decorate a main table, a podium, a stage if there will be a band playing - The US Marine Corps band is usually on hand at Marine Corps ceremonies. Red, white, and blue bunting is a favorite for decorating round tables. It is reminiscent of the original, cloth material used to dress up the town's gazebo for patriotic holidays. Personalized red, white, and blue banners or ribbons can also be used in table decor, as well as serve as keepsakes. CeremonialSupplies.com has an extensive selection of ceremonial ribbon in a variety of colors and sizes, including oversize ribbons 8" - 10" wide of 25 yards and up. As ceiling drapes, these large ceremonial ribbons help bring together any vacuum space such as a high, or white, ceiling or bland colored walls. Red and white draped ribbons at a military ceremony look stunning and exalt the senses! Military Award Plaques Are Perfect For Military Red Carpet Ceremonies! You always want to thank those who make things possible. Military award plaques are perfect for military red carpet ceremonies that want to recognize one, or more service members of a military branch for their achievements, bravery, courage, or to celebrate a commemorative occasion. We have at CeremonialSupplies.com an elegant and stylish collection of military award plaques, imported, or finely crafted with all US made materials. Designs range from vertical and horizontal military award plaques with official branch emblems, to ship's wheel, and other designs that include a plate for engraving or a clock. All the military award plaques we carry have the approved, official armed forces emblem or insignia. Come over and take your pick! From a military wedding, to the presenting of the colors, and more, CeremonialSupplies.com has all the essential supplies and products for a military red carpet ceremony. Our products are of the finest, crafted quality and are available at reasonable, budget friendly prices. For the smoothest ordering experience, most personable live customer service, and for the fastest and most efficient shipment wherever you are, get all your military red carpet ceremony supplies with us! CeremonialSupplies.com.